Free shipping. Buy direct from HP. 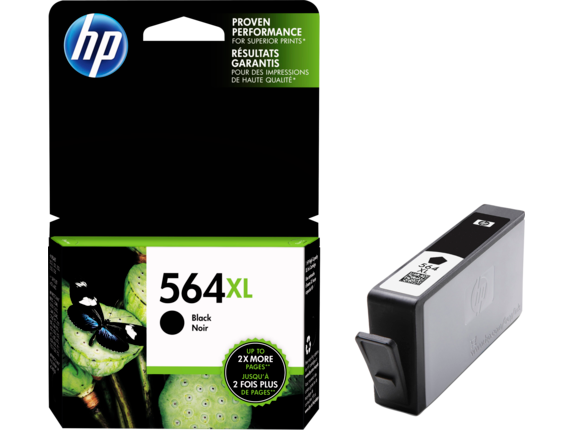 See customer reviews and comparisons for the HP 564XL High Yield Black Original Ink Cartridge. Upgrades and savings on select products. Use Original HP inks and HP Photo Papers to print water-, smear- and fade-resistant photos. [1,5]Print documents with vivid colors and rich black text. HP recommends ColorLok® paper for best results.Count on black text that resists smearing from highlighter pens—great for projects and everyday prints.HP proprietary inks prevent corrosion and clogging of the printhead, ensuring the best prints. Get up to 2 times more black printed pages for an affordable price, using high-yield cartridges. Use convenient ink alerts to easily identify and shop for Original HP cartridges with HP SureSupply. Load cartridges with ease—unique color and fit ensure right color ink is in the right place. Use Original HP inks and HP Photo Papers to print water-, smear- and fade-resistant photos. [1,5]Print documents with vivid colors and rich black text. HP recommends ColorLok® paper for best results.Count on black text that resists smearing from highlighter pens—great for projects and everyday prints.HP proprietary inks prevent corrosion and clogging of the printhead, ensuring the best prints. Get up to 2 times more black printed pages for an affordable price, using high-yield cartridges.Use convenient ink alerts to easily identify and shop for Original HP cartridges with HP SureSupply.Load cartridges with ease—unique color and fit ensure right color ink is in the right place. 1 Based on paper-industry predictions for acid-free papers and Original HP inks; colorant stability data at room temperature based on similar systems tested per ISO 11798 and ISO 18909. 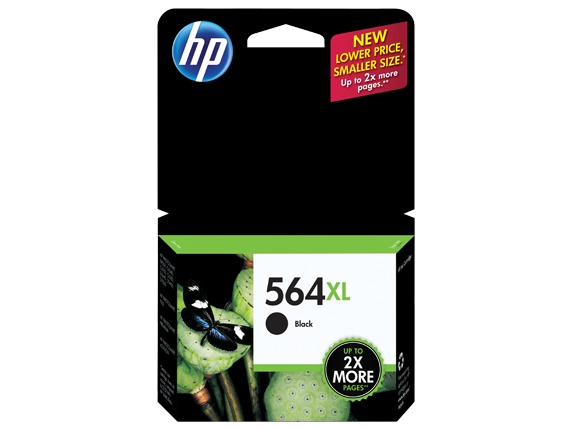 2 Based on HP 564XL High Yield Black and Color Original HP Ink Cartridges. High-yield ink cartridges not included; purchase separately. For more information, see http://www.hp.com/go/learnaboutsupplies. Less cost per page compared with manufacturer recommended street price and published page yield of standard-yield HP 564 Original Ink Cartridges. Actual pricing may vary. 3 Program features, retailer participation, and availability may vary by country. Internet access is required and not included. For more information, visit http://www.hp.com/learn/suresupply. Not compatible with Windows® 2000. 4 HP Planet Partners availability varies. For details, see http://www.hp.com/recycle. 5 Image permanence estimates based on Original HP inks printed on HP Photo Papers. For more information, see http:www.hp.com/go/printpermanence. 6 Compared with standard-capacity HP ink cartridges. Based on published page yields (http://hp.com/go/learnaboutsupplies) 1 Based on paper-industry predictions for acid-free papers and Original HP inks; colorant stability data at room temperature based on similar systems tested per ISO 11798 and ISO 18909. 5 Image permanence estimates based on Original HP inks printed on HP Photo Papers. For more information, see http:www.hp.com/go/printpermanence.